Seven people were injured after the taxi they were travelling in collided head on into a truck at the Verulam intersection on the R102 a short while ago. At approximately 09:06 members of Reaction Unit South Africa were called out to the scene after receiving multiple calls from passing motorists and pedestrians reporting the collision. Upon arrival seven occupants of a Toyota Hiace including the driver were found to have been injured. Five people were in a serious condition and two other passengers sustained moderate injuries. One person was trapped in the taxi and the jaws of life had be used to free him from the wreckage. 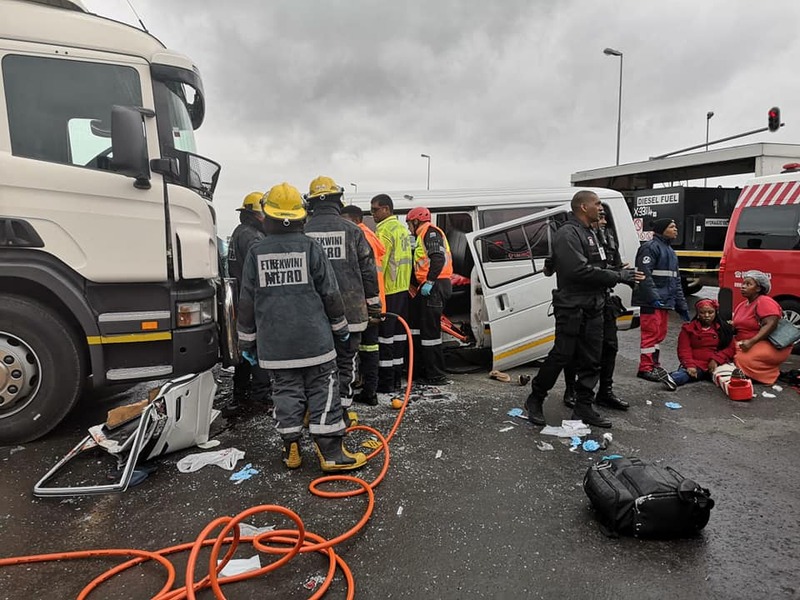 Medics from several private ambulance services as well as the provincial ambulance service stabilised the injured on scene before transporting them to Osindisweni Hospital. The driver of the Scania truck claimed that he was turning onto the R102 from Wick Street when the taxi allegedly drove through a red robot and collided head on into his vehicle.